May is Asian/Pacific American Heritage Month! Given the recent intense spate of conversations about Orientalism, whitewashing, and white saviorism in pop culture, I thought it would be useful to collect the storifies, articles, and other media discussions I’ve done related to these issues. I’m rather proud of these works, and I’m delighted several of these pieces were written/produced with my friend and Raks Geek founder/producer Dawn Xiana Moon (I highly suggest reading her recent essay from Uncanny Magazine, “A Work of Art is a Refuge and Resistance” which explores what it’s like to be a “Third Culture” kid and the importance of art and SF/F). I hope you’ll find them useful. Also later this month, I’ll have a blog post listing some works by AAPI creators that I’ve particularly enjoyed and would recommend reading! 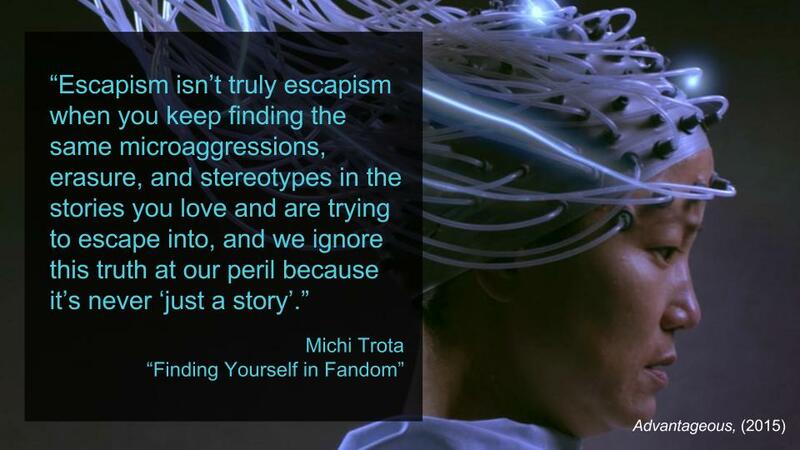 This entry was posted in Culture, Panel and tagged APAHM, Asian Pacific American Heritage Month, comics, Doctor Strange, Ghost in the Shell, Iron Fist, orientalism, pop culture, white savior, whitewashing by Michi Trota. Bookmark the permalink.